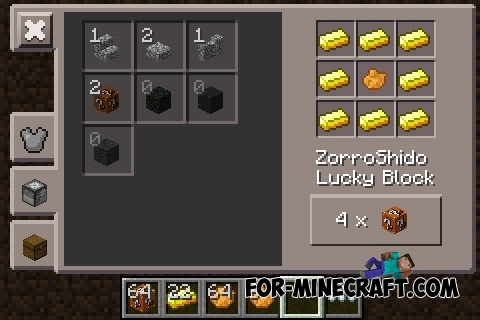 Here is a new version of Lucky Block mod. After the destruction of the block, you can get anything. This can be a huge explosion, a collection of items, the crowd of evil monsters, interesting structure and another. Some blocks are accompanied by an audio track. This mod is indispensable to play with friends. You need to enter the command / lucky to get a block or get in creative mode. Copy "Zorro" folder in "/com.mojang" (Sound files). Install the texture pack, and then the script.